Life Before the Dinosaurs: Eldonia. 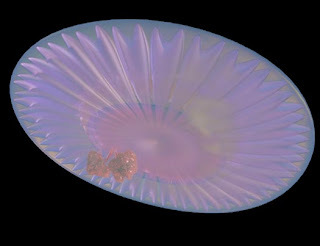 The reconstructions may be somewhat outdated (you'll notice Nectocaris) but it's a cool image. Eldonia and its relatives were benthic, and not pelagic as once thought. Researchers began to suspect that it was not pelagic due to the arrangement of encrusting animals on specimens of the Chinese Rotadiscus. Because these barnacle-like animals were found near the edges, and never on the center lead one researcher to believe that the animals lived on top of the mud. If eldonids were pelagic, then the encrusting animals would be scattered randomly all over the surface. 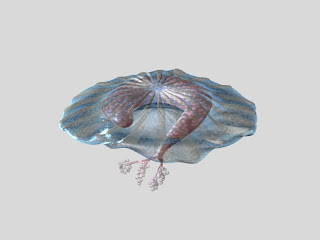 Another researcher then realized that the biomechanics were all wrong, too, in that, if Eldonia was a jellyfish-like swimmer, it could not pulsate with its internal organs in a ring around what appears to be a filled center. "Just as its affinities are enigmatic, so also is its lifestyle. While its medusoid shape suggests a pelagic lifestyle, other researchers believe it led a benthic and passive life on the sea bottom." Is there anything online or in a book covering what you've posted here? I know Art would love to read more. A very good book (but slightly out of date) to start with is "The Cambrian Fossils of Chengjiang, China: The Flowering of Early Animal Life"
And this paper here explains the situation of Eldonia's life-habits better in more, and bigger words. The diagram on page 8 sums everything up, though. Thanks Stanton. I was glad to be able to print off the paper you gave the link to. The picture of the reconstruction of the animal is very useful. And Art, thank you even more. I've just become interested in the life at the time of the Burgess Shale and have got more information from your site than anywhere else.